Even in a world that has become accustomed to cyber threats, the antics of hackers can still raise eyebrows. In a recent incident, hackers reportedly stole a casino’s high-roller database. While hackers stealing a database is not surprising in and of itself, their tactics in this particular instance were. It turns out that these hackers were aided by a thermometer in a casino-lobby fish tank. In another incident, hackers tried to blow up a petrochemical plant in Saudi Arabia. The one thing that stopped them was a bug in their own code. Given the amount of customer data they possess, the retail sector is one in which stories of escalating hacker sophistication and determination cause particular alarm. However, many retailers still see cybersecurity – the protection of consumer data, enterprise information, and intellectual property – in terms of mitigation costs. Many are missing a vast opportunity because cybersecurity can be a viable source of competitive advantage in the sector. We recently surveyed 6,000 consumers across the world on this topic. 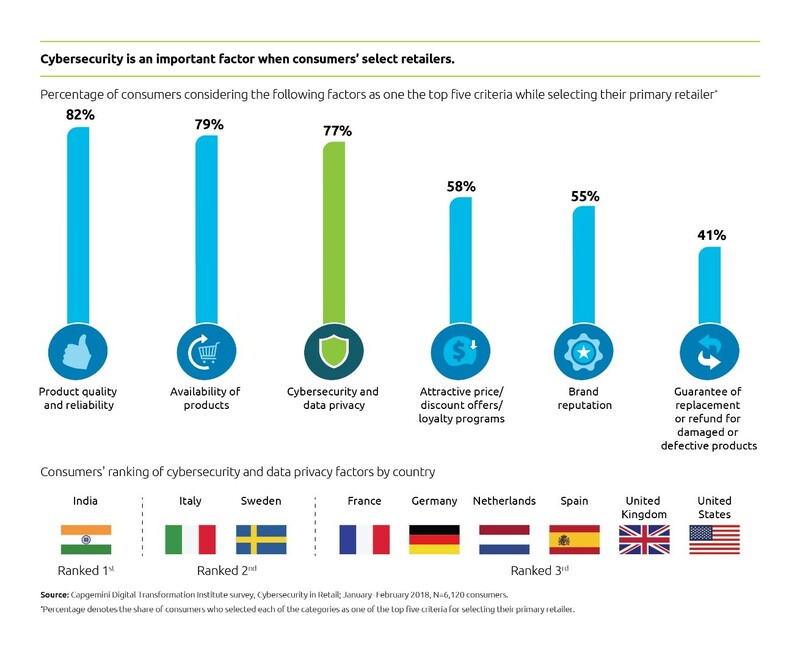 We found something very interesting: consumers now see cybersecurity and data privacy as one of the three main reasons to select a retailer, beating even price (see Figure 1). In India, it even comes out on top as the number-one reason to do business with a particular retailer. Many retailers are unaware that they are missing a trick when it comes to customer satisfaction or that focusing on cybersecurity and data policies can have a direct effect on customer satisfaction. We asked consumers to rate their satisfaction levels if a retailer implemented several cybersecurity and data privacy capabilities. We found that the share of satisfied customers increased from 9% to 22% when consumers knew their primary retailer had implemented these capabilities. Our research shows that consumers are particularly interested in specific capabilities – for example, encrypting stored data and offering a prompt for account passwords have the biggest effect on customer satisfaction. Assurance that the retailer’s websites and apps use the most advanced security technique – for example, 256-bit Secure Sockets Layer (SSL) encryption or Transport Layer Security (TLS). Approximately 40% of consumers would be willing to increase their online spend by 20% or more if their primary retailer gave them these trust-building assurances and competitors did not. Few retailers inform their consumers of a breach before the media does.